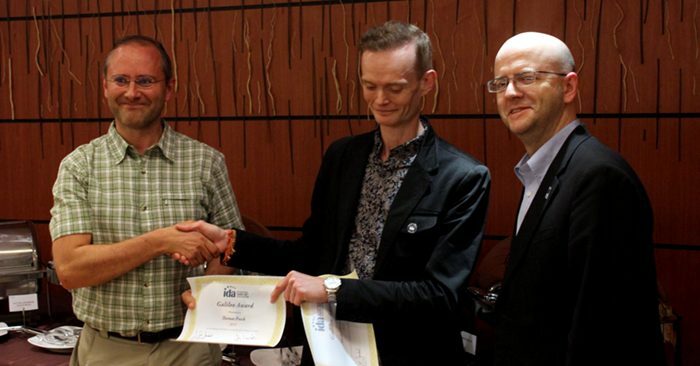 Martin Morgan-Taylor (center) and John Barentine (right) present Thomas Posch with the 2014 IDA Galileo Award. Photo by Andreas Hänel. The light pollution research community lost a remarkable young scholar last week with the untimely death of Dr. Thomas Posch. In addition to his work in light pollution, he is remembered for his research on the history of astronomy as well as his interest in science outreach and education. Born in Graz, Austria, Dr. Posch studied astronomy, physics, mathematics and philosophy at the University of Graz, the Free University of Berlin, and the Technical University of Vienna. Equally at ease discussing in French the work of the German philosopher Georg W. F. Hegel and his own astromineralogy research in English, he achieved the distinction of earning two doctoral degrees: one in philosophy and the other in astrophysics. From 2003 until his death, he was a lecturer in astronomy, the history of science, and philosophy at the University of Vienna. In 2006 he was named a research assistant at the University’s Institute for Astronomy, and in 2009 he served as Austrian Coordinator for the International Year of Astronomy. Dr. Posch was president of the History of Astronomy Working Group of the German Astronomical Society. In his astronomy career, Dr. Posch led or co-authored over 45 publications and was an expert in the chemistry of dusty shells formed in the atmospheres of evolved stars. He also wrote dozens of articles on the history of astronomy, and in 2017 he published Johannes Kepler: Die Entdeckung der Weltharmonie (Johannes Kepler: The Discovery of World Harmony), a new biography of the famous astronomer. Throughout his career, he believed firmly that the big questions of science required the humanities to properly address and understand, and he brought to his work both the careful eye of the scientist and the reasoned worldview of the philosopher. It was this unusual way of thinking that drew Dr. Posch’s attention to the interdisciplinary field of light pollution research. After completing his second doctorate in 2005, he performed required service for the Austrian Armed Forces, during which he carried out a study of the brightness of the night sky with applications to military training. He was a member of the International Astronomical Union (IAU), and served as a member of IAU Commission 50 (Protection of Existing & Potential Observatory Sites) between 2011 and 2015. In the last decade of his life, Dr. Posch became increasingly involved in light pollution research. He helped establish a network of sky brightness monitoring stations across Austria, and was a key contributor to papers ranging from a rigorous measurement of the brightness of moonlight to a recent review of the latest advances in technologies to quantify night sky brightness. In 2014, IDA presented him with its Galileo Award, given “in recognition of outstanding achievements in research or academic work on light pollution over a multiple year period.” The award followed the 2013 publication of the second edition of Das Ende Der Nacht (The End of the Night), a German-language light pollution reference whose creation he led that has become a standard work in the field. We are left to wonder how many other contributions Dr. Posch would have made to our understanding of light pollution. While the world has lost a leader in this field, IDA pays tribute alongside his colleagues to his lasting legacy. His scholarly enthusiasm, intellectual aptitude, and friendly personality will be greatly missed.